NAMM 2013: Kemper - maker of the acclaimed Kemper Profiling Amp - has unveiled Cabmaker, a new software tool that will allow users of the amp to load cabinet profiles using impulse response (IR) files. 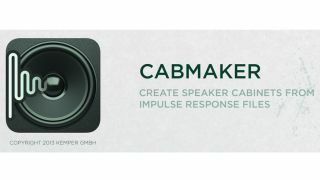 Developed following a wave of user requests for IR integration, Cabmaker reads IR Wave files (essentially acoustic profiles of different speakers and/or rooms) and uses them to produce cab presets that can be stored on the Profiling Amp. This will allow users to browse pre-existing IR Wave file libraries and turn them into custom settings on the amp. We suspect (much like the amp itself at this point) that this new feature will mainly appeal to the studio player. The amp itself was only unveiled at Winter NAMM 2012, but has already made a significant impact on the guitar/studio world. We reviewed it in April, calling it "a product that finally delivers on the promise of digital modelling" and awarding it four and a half stars. Kemper Amps/ Ruhr Area, Germany - January 23rd, 2013 (ictw) - Today Kemper Amps, the makers of the highly acclaimed and award winning Kemper Profiler announce the new Kemper Profiler Cabmaker Software. A lot of owners asked for a way to load impulse responses into the Kemper Profiler to extend the amount of available Cabinet simulations. There are a lot of places where users can access libraries loaded with IR taken from the most diverse kinds of speaker systems. "So be it": thought the team and created Cabmaker, a straightforward software tool for Mac and PC that reads IR Wave Files and converts these into local Cab Presets for the Kemper Profiler. The Kemper Profiling Technology caters for lively and dynamic Cabinet performance even with just static IR Data. Cab Converter is a free download from the Kemper Amps website.